Sterling silver diamond set hoop earrings. 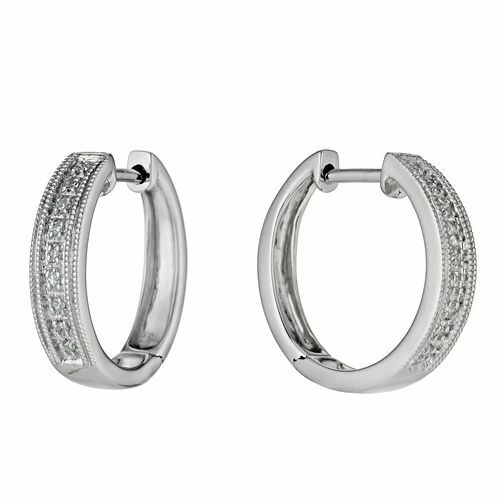 These diamond hoops are elegant yet wearable for any occasion. Sterling silver diamond set hoop earrings is rated 1.8 out of 5 by 4. Rated 1 out of 5 by Anonymous from Really poor quality - disappointed Received these as a gift for my birthday and they looked really nice. Only managed to wear them twice before the clasp became very loose indeed on one of them. Returned to the store and they were sent for repair. They came back to the shop 4 weeks later still exactly the same with the same loose clasp issue. I refused to accept them back from the store. If you are thinking of buying these earrings, don’t. They look really nice but the quality of the clasp is best described as awful and certainly not fit for purpose. Rated 1 out of 5 by Anonymous from Brought the fitpoor quality Got them as a gift....one of them had a very loose latch so kept falling out. They said they would replace them with a new pair. My then boyfriend picked the "new pair" up and I encountered the same problem. I doubt they replaced them at all! !....I now do not have access to the receipt so I am left with a pair of diamond earrings that I cannot wear.